One of the things I love looking at is advertising signs or posters featuring our favorite sports stars. I would love to pick up a few Yankees pieces one day, but don't know how to go about grabbing one, where to get the or how to tell a repo from a real sign. That said, post what you all have. Vintage, modern everything in between. Baseball, football, hockey,basketball. Please post them here. This may be slightly O/T, but here is a wood stadium vendor sign. Last edited by vintagesportscollector; 06-21-2017 at 02:25 PM. Polo Grounds - Knickerbocker Beer ad sign, cardboard. Funny, I always thought the Giants were on WOR-TV, channel 9 here in NYC. Always thought WPIX was exclusive to the Yankees back in the days. You learn something new everyday. Brimsek/Ross and Smith/Patrick 24x18", Kraut Line about 21x17"
This may be slightly O/T, but here is a stadium vendor sign. One of my favorite pieces that I don't currently have displayed is this Bruck's Beer advertising poster with Johnny Vander Meer. I have been told that a former employee of Bruck's saved this poster after it had been on display somewhere in Cincinnati. Bruck's Beer was apparently one of the stadium advertisers at now defunct Crosley Field for many years. This was a pickup at The National a few years ago and it came from the long-time outstanding Cincinnati Reds collection of Steve Wolter (Sports Investments). Dimensions of the poster is 18" x 24"
Last edited by Scott Garner; 06-22-2017 at 03:46 PM. I was under-bidder on a similar one over 10 years ago.... and have not seen one since. It was NRMT, amazingly. I sure wish (in retrospect) that I pursued it more aggressively. Last edited by perezfan; 06-21-2017 at 02:55 PM. I was under-bidder on one over 10 years ago.... and have not seen one since. It was NRMT, amazingly. Wish (in retrospect) that I pursued it more aggressively. Thanks Mark! I would have to agree with you on Bob's great advertising collection. Not exactly bobfreedman quality, but here ya go. 3 Falstaff/Giants beer signs, 1963 Old German beer calendar and a Hamm's store display card. Beer and baseball...I love them both! Here are a few of my advertising pieces. Notice the baseball scene in the background of the top hat piece. Great stuff, Ron! As much as I despise the Dodgers, I've always loved the Schaefer piece. Thanks Rob. Not in the best shape but It's one of my favorite advertising pieces. Such awesome pieces guys. I am digging those SF Giants and that 1955 Brooklyn Dodgers Schaefer Beer piece. 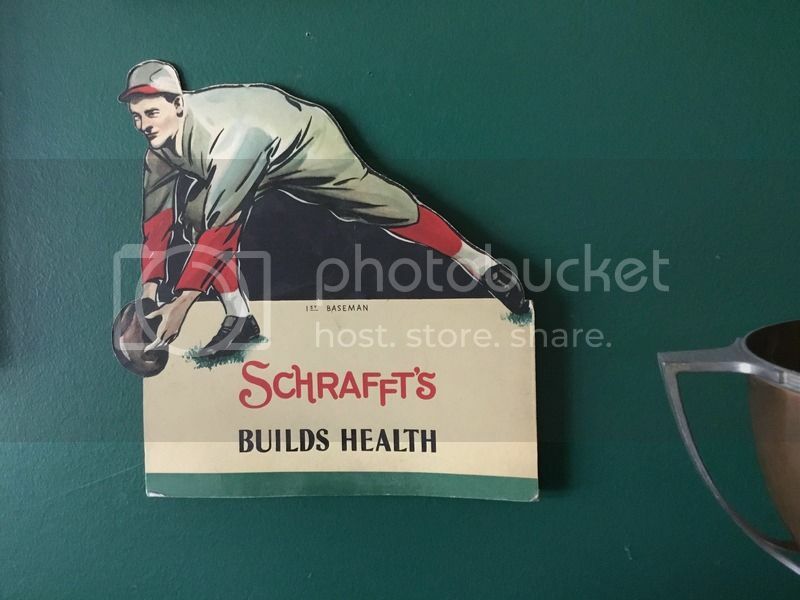 I remember as a kid Schaefer became the sponsor for the Mets, which is how I associate Schaefer with. I remember in college, my buddy and I used to have steak & bad beer nights and Schaefer was one of the beers on the menu. Last edited by yankeesjetsfan; 06-22-2017 at 08:31 AM. Last edited by drcy; 06-22-2017 at 12:58 PM. 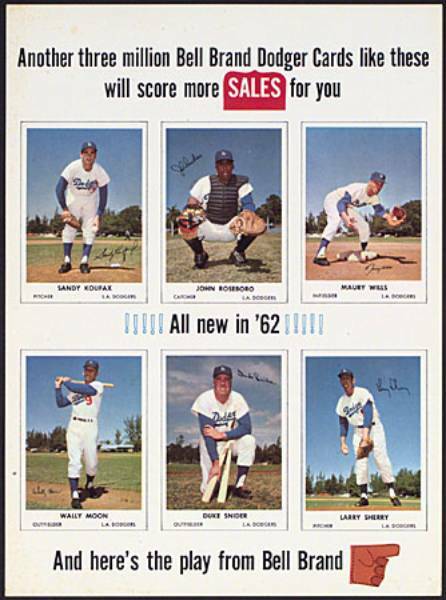 I love those baseball card advertising signs. Those are some awesome advertising pieces. Thanks so much for posting. Last edited by Mark70Z; 01-31-2019 at 07:54 PM. 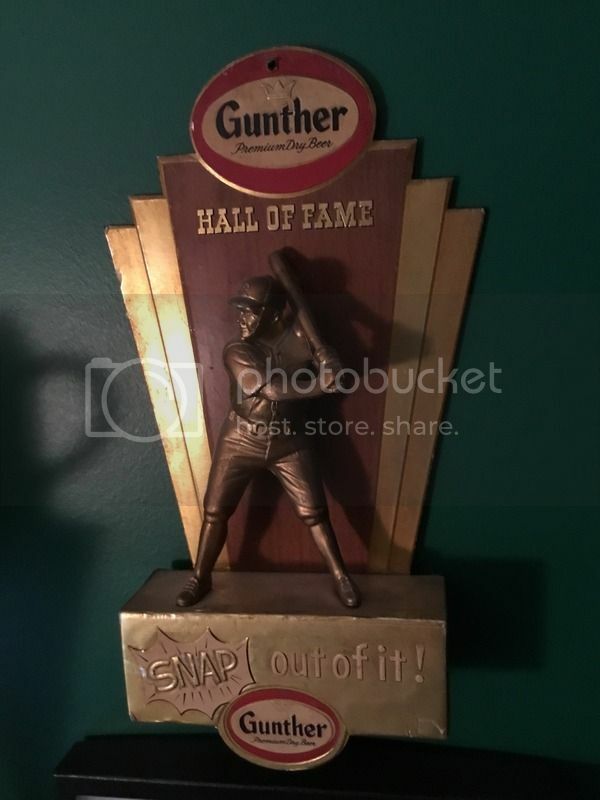 I've posted a fairly common '59 Orioles Gunther piece, but really makes for a nice display. Yeah, I love the look of that! What's the size? Last edited by Bobmc; 06-22-2017 at 09:26 PM. Great pieces everyone. Keep them coming! Any advise on picking up advertising pieces? I'd be looking to grab 1970's & 80's Yankees. The piece is roughly 35"x24"; so fairly large. Love this, too! "hair tonic"
Unsure if this would help, but since I collect Orioles items I typically search for "Orioles sign or banner" on eBay and search just Orioles items w/in auctions. I've picked up several pieces over the years in this way. Also, let collectors and dealers know what you collect and make connections and often time friendships will be established. I'll have people routinely tell me about items available as well as items they've seen or heard about that I may be interested in. Great advice sir. Thank you so much. My dear friend, Bob. Without question, you are the KING of advertising signs! Last edited by Scott Garner; 06-24-2017 at 05:15 AM. Sweet Yellow Submarine advertising piece, Jimmy! I remember these jumbo stick-on's from when I was a kid. Last edited by bobfreedman; 06-24-2017 at 06:41 AM. Thanks Bob, as always, great items you are showing. Love seeing it all! Awesome Jimmy!! Still have my Blue Meanie sticker!!! Metal signs. One more to come later that is being difficult to upload at the moment. Last edited by brookdodger55; 06-24-2017 at 12:36 PM. Wonder if it's ok to start a Beatles Thread here... would really love to see more. The Double Header is actually large (18 x 14ish) but I cannot seem to resize it??? Bob you just aren't running out of great stuff to post . Michael, love the metal signs!! The Rawlings Mantle looks great. Last edited by Mark70Z; 01-31-2019 at 07:56 PM. Last edited by 71buc; 06-25-2017 at 07:45 AM. Last edited by Bumpus Jones; 06-25-2017 at 08:44 AM.